Description: 150mm uPVC Rosewood 16mm Full Replacement 5m Fascia Board No Backing Timber Required Colour: Rosewood Dimensions: 16mm x 150mm x 5m .. Description: 175mm Rosewood 16mm full replacement 5m fascia boards No Backing Timber Required Colour: Rosewood Dimensions: 16mm x 175mm x 5m .. Description: 200mm Rosewood 16mm full replacement 5m fascia board to go on to timber joists No Backing Timber Required Colour: Rosewood Dimensions: 16mm x 200mm x 5m .. Description: 225mm Rosewood 16mm full replacement 5m fascia board to go on to timber joists No Backing Timber Required Colour: Rosewood Dimensions: 16mm x 225mm x 5m .. Description: 250mm Rosewood 17mm full replacement 5m fascia to go on to timber joists No Backing Timber Required Colour: Rosewood Dimensions: 17mm x 250mm x 5m .. Description: 300mm Rosewood Finish 16mm full replacement 5m fascia board, no backing tmber required. Dimensions: 16mm x 300mm x 5m .. Description: 400mm Rosewood 16mm full replacement 5m fascia to go on to timber joists No Backing Timber Required Colour: Rosewood Dimensions: 16mm x 400mm x 5m Please note this is a double-edged board it does not have a cut edge, if you need a straight cut edge you can .. 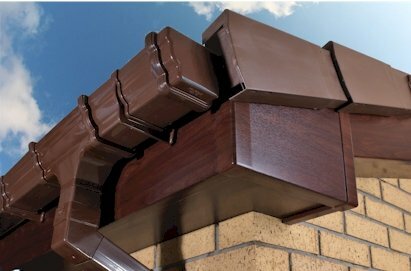 Product Length: 500mm Product Width: 50mm x 50mm Accreditations: BSI Approved Guarantees: 10 years Product Type: uPVC 500mm Rosewood Internal Double Ended Fascia Joint .. Description: Matching Foiled Rose Wood Finish 300mm fascia Joint .. Description: Matching Foiled Rose Wood Finish 300mm Fascia Corner Joint .. Description: Gable Finial Rosewood Gable Finial .. Product Dimensions: 500mm long Product Width: 50mm x 50mm Accreditations: BBA & BSI Approved Guarantees: 10 year Manufacture Guarantee ..